An air- balanced, lean-steered bicycle. It has a very powerful fan that directs two conical air flows at the ground, one on each side. If the bike starts to lean over, then one of the funnels gets closer to the ground, the air can’t get out so easily so that funnel is pushed up more. The same lean will also lift the other funnel further from the ground so the air escapes more easily giving a reduced force. With the lower funnel pushing more and the higher one less, the bike is automatically blown back upright until the flow from the two funnels balances once again. Because it is intrinsically self-balancing, it is probably the only bike that can stop, go backwards and do 3 point turns without falling over- it doesn’t need to be moving to achieve balance. It is driven forward by a slight backward angle of the funnels supplemented by a small motor driving the rear wheel. To steer the bike, there is no direct control of the front wheel. 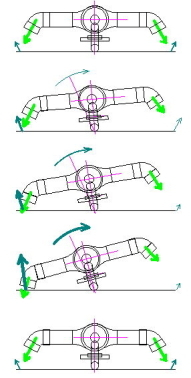 Instead, by altering the relative airflow between these two balancing nozzles (by turning a small diverter vane) the bike can be made to lean, and so cause the front wheel to ‘castor’ and achieve the turn (like riding a bike ‘hands-free’). 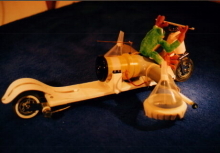 The frog is functional; his arms restrict the movement of the steering, and his flowing scarf indicates the diverter vane position to aid the Roboteer steering it.